The Superintendent wanted to confirm the existing network inventory was accurate and the district was not spending more than a private enterprise. The district made several technology changes and were pursuing a web-based instructional and information hubs throughout the district of 50+ schools. The partners of NSA set themselves apart by taking a no obligation complimentary look at the environment, bringing actionable market data indicating private enterprises were acquiring the same services for 40% less than the school district. The results were greater than the market sensing provided and is a consistent result in our approach. Following an Audit process of accurately defining the network inventory, old mainframe Intra-Lata private lines billed at tariff were officially removed and credits applied for missed cancellations requested years earlier. Club Billing was uncovered, spamming and cramming of voice accounts corrected, old network access points and “other” obsolete services not in use but still being billed identified. Due to the inconsistency of the account support, erroneous billing and e-Rate timing the choice was made to conduct a Full RFP to test the market. Although there was little change to the vendor combination, the district experienced a 54% reduction in total out of pocket expenses which provided for additional funds in a tightening e-Rate environment. A bonus was the reduction in the gross amount of Federal Universal Service Fee reimbursement on the US taxpayer. The challenge to the district when evaluating network costs is the amount the e-Rate program reimburses school districts, especially those districts with a high level of lower income. In our experience, the out of pocket costs after e-Rate application for many districts did not support the investment of over committed internal resources to pursue the potential savings. 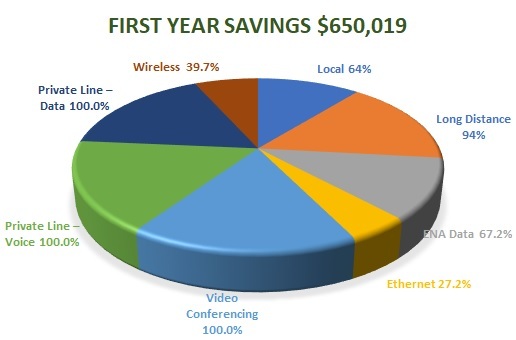 The RFP netted market results in all eight categories up to 100% representing over $650K in annual savings, an out of pocket reduction of $200K, savings to the US taxpayer of $450K in e-Rate reimbursement and an overall reduction of 46% in total annual network spend with ten times the Internet thru-put for the expansion of Internet based instruction. The school district relies solely on tax payer funding, and with this engagement was able to reallocate the savings to other fund challenged efforts. 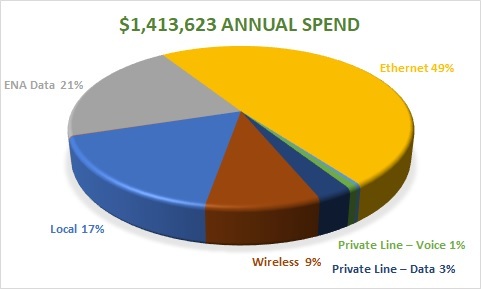 A rural county school district with over $1M annual spend across eight communication categories supporting 50 school locations restricted by e-Rate procurement rules and county bidding laws with a long standing carrier relationship. Delivery of market sensing data generated interest in opening the existing network to other vendors and the engagement was approved. Consolidation recommendations of some services completely eliminated spend in three categories. In addition multiple disconnects continued to invoice after the decommissioning of the AS400 network. These refunds were pursued at the carrier level. The full RFP and negotiation was time sensitive to meet e-Rate requirements, and the market sensing RFP process required a creative approach not to violate county purchasing rules while still leveraging market data. It all begins with a conversation about your situation and needs, to begin the conversation please complete the information on the right-hand side of the page.